Kim Kardashian has been slammed on social media after posting a tribute to the victims of the Manchester terror attacks. The celebrity took to social media to share a post just hours after 22 people had been killed by a suicide bomber on Monday night. 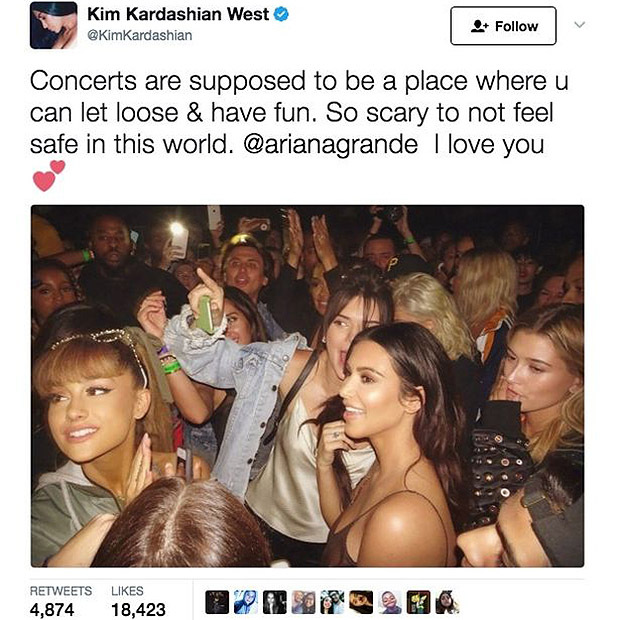 Kim shared a photo of herself with Ariana Grande as a tribute to the victims of the attack. "I'm praying for everyone in Manchester," she wrote on Instagram. "This is truly so senseless & heart breaking. I can't imagine the fear and agony these parents must be going through searching for their kids. "Concerts are supposed to be a place where u can let loose and have fun. "It's so scary to not feel safe in this world. My heart goes out to @arianagrande I love you". The photo shows Kim grinning with her sister Kendall Jenner while standing next to Grande. Many social media users hit out at the reality TV star saying the photo was offensive and inappropriate. One wrote: "Why do you put this picture of you patying with Ariana Grande @kimkardashian So pathetic and sad!" Another added: "why does she need a picture of Ariana & herself. "To be honest this tragedy is not about either one of them, people lost their lives at some point it's just tacky to impose yourself into situations#BadDecision sorry this has nothing to do with you Kim, stay out of it." A third agreed, writing: "It is a literal tragedy and we are all praying but seriously Kim you are just posting a pic of yourself with Ariana barely in it and all faces are happy af and this is how you express your sadness? So sorry for you." Unsurprisingly, Kim has since deleted her post. Meanwhile, Ariana has arrived back in the States with her mum Joan Grande nearly 24 hours after the terror attack. It is believed the private jet used by Ariana to leave the UK was donated by Taylor Swift, who had earlier tweeted to send the 22 victims and 59 injured her best wishes. "My thoughts, prayers and tears for all those affected by the Manchester tragedy tonight. I'm sending all my love," Taylor posted last night.